I am a local Adelaidean wanting to write about the places I go, things I see and wines I taste. For me, there is nothing better than sitting with a magnificent glass of wine in a relaxing atmosphere, while listening to some great background music and chatting with newly made friends. For these reasons the Botanic Bar, on the corner of East and North Terraces in the city, is always on the top of my list as a first stop on a Friday or Saturday night out on the town. The bar has an ambience like no other in Adelaide. The funky bar exudes class and style while also bringing a sense of comfort and ease. 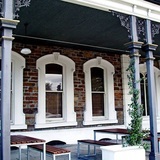 It is a great place to start any night out or for a few relaxing wines to finish a day. There are both booths and small tables for a more intimate gathering, as well as the less intimate areas to meet new people. I find the patrons to be very friendly and open to having a good conversation, more so than most of the other bars in Adelaide. The bar staff have always given friendly hospitable service when I have dealt with them and usually go above expectations to make patrons feel most welcome. So for a great start to the night or finish to the day, I recommend checking out the Botanic Bar to indulge a little with a fine wine or cocktail while being surrounded by good company. Why? The bar has an ambience like no other in Adelaide.